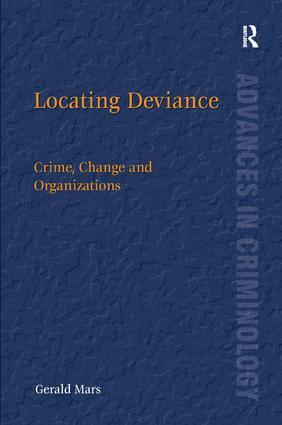 This book takes a radical look at organizational crime and deviance through the prism of Cultural Theory derived from anthropology. It does so through case studies and by introducing new concepts such as 'organizational perversion', 'tyranny' and 'organizational capture'. Exploring the effects of change and environmental influences such as globalization, new technologies and trade-cycles on the nature and potency of criminogenic communities such as ports and holiday resorts, the book gives special attention to the justification of ethics and to the analysis of behaviours that have contributed to the current economic downturn. The Appendix offers a practical guide to the ethnographic assessment of links between organizations and varying types of crime and deviancy using a Cultural Theory framework. Gerald Mars left school at 16 and worked in over thirty jobs before going to Cambridge at twenty-six to read anthropology and Economics followed by a Ph.D. at the LSE. In 2003 The Royal Anthropological Institute awarded him the Lucy Mair Medal in Applied Anthropology 'for consistent excellence in applied anthropology'. He is currently Hon. Professor of Anthropology at University College, London and Visiting Professor at University Campus Suffolk.